Lately I’ve been on a mission to simplify my life as much as possible, as a stay at home mom. I was determined not to go through another year feeling like I could never catch up and yet was missing out on the most important things in my life. I have simplified my cleaning routine, my children’s chores, my meal planning, my schedule and my business. As a stay at home mom and as a mom who works at home, I wear so many hats that it can be overwhelming! I knew I needed to implement some productivity routines to help me balance everything I had going on. I’ve discovered some productivity habits that really help me to streamline my time and my life in general. I find that by cutting out a lot of the unnecessary, or decreasing how much time I need to spend on my to-dos, I’m left with a lot more time and energy to devote to what I truly love and enjoy doing. 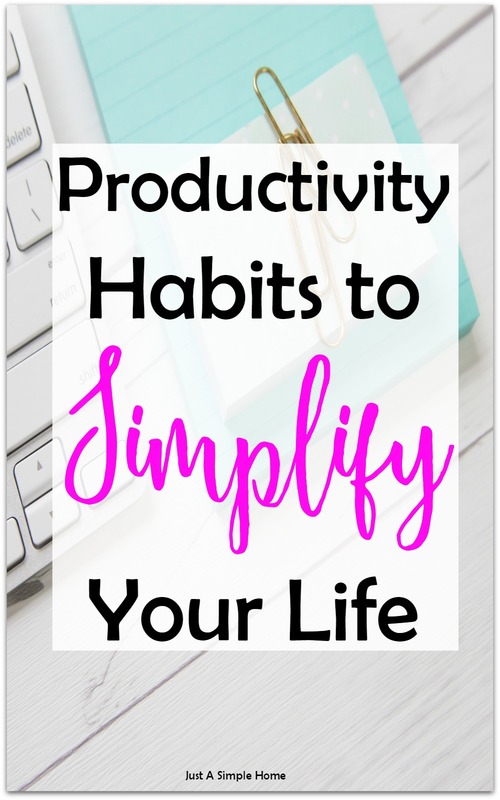 I learned a lot of these tips with the tools I got in the Ultimate Productivity Bundle, which is an incredible resource if you really want to learn all things productivity as a stay at home mom! I know it can be so hard to simplify things as a busy wife and mother. But it is imperative to your health and well being! Think about what you are teaching your children if you are always running around with too much on your plate. They will follow your lead! There are many ways that a streamlined life can have a positive impact on your overall well-being and help you feel more empowered when it comes to your future and achieving your dreams. 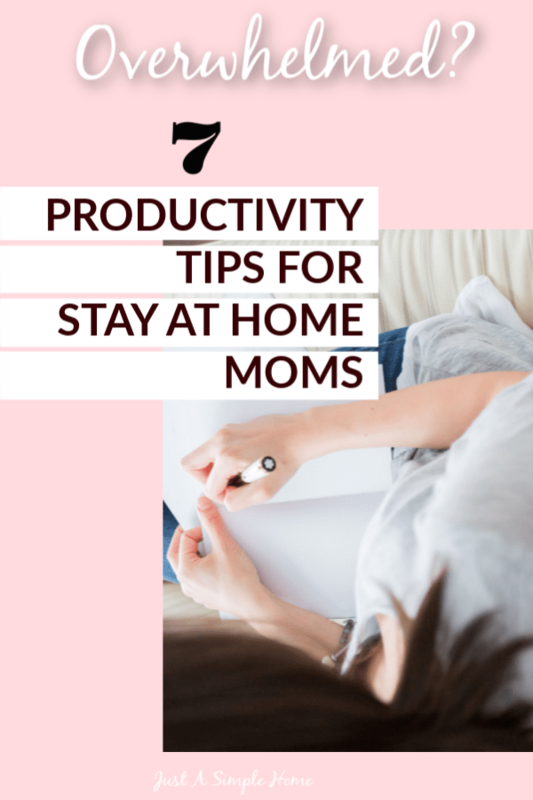 Here are my top productivity habits for stay at home moms to streamline your life and help you get on the path to feeling empowered! I can NOT function without a list! Seriously, I have a list at all times, and I typically have multiple lists. For example, a grocery list. We keep a magnetic notepad on the fridge. As we run out of things, it goes right on the list. The kids are trained to add to that list as they see a need. The family also knows that if it doesn’t get on the list, it doesn’t normally make it in the house! Keeping a running list on the fridge means I don’t have to go rummaging around the house, deciding what we need when it is time to head out the door. This also helps to prevent you from forgetting anything and having to do another trip shortly after. As a busy mom, I am more about routines than schedules. Routines don’t sound like the most exciting thing to take on, but they really can do wonders for your productivity level. There are homeschool routines, cleaning routines, morning routines, workout routines, etc. I think the best approach is to pick one type of routine to help you simplify your schedule and some tasks that you need to accomplish. After that one routine is established, then maybe move on to incorporating another into your life. This is a great way to save some time and energy on remembering to pay monthly bills. Automate as many bill payments as possible so you don’t have to fret about paying anything late (or worse, actually paying late and then having to pay for a late fee!). If you are a blogger, figure out how you can automate your social media platforms! I know, lists again! Are you catching a theme here? Be sure to create a to-do list the night before, so you can wake up feeling less frazzled. If I already have my planner filled out and my list made for the day, I know I can wake up in the morning and have my quiet time with the Lord, without distractions. The biggest thing is to figure out your top 3 priority tasks for the day, and try to tackle the most challenging one first. Accomplishing your hardest task of the day will likely keep you motivated enough to keep trucking through your list. I had a number of years where I would run around like a mad woman, trying to do it all. As my kids have gotten older, I have learned that it doesn’t do them any good to see me doing everything. They need to have me at peace as much as realistically possible. I have learned to delegate many household chores to my children. It is good for them! It teaches them life skills, how to run a home, and how to work together. I also keep a small, “honey-do list” for my husband. Not in a nagging way, just a list of things that may need to get done around the house that he tends to be more efficient at. Are there any productivity habits that you’ve found helpful in streamlining your own life? Don’t forget to check out the Ultimate Productivity Bundle below! I am a huge list maker and take great joy in checking things off the list. Saying No is huge too. Love how you are breaking down and streamlining the process! I love making lists! It’s even better when I can cross things of those lists for a sense of accomplishment. I need to work on saying no more, though. If it’s not on the list, it doesn’t get done! My husband asked me yesterday if I took the car in to get it’s oil changed and I told him, it wasn’t on the list. Now it’s on the top of my to-do list and you can bet I won’t forget about it! OH I need to work on routines! 😛 Good stuff! I really need this at the moment! I’m finding it hard to get back into writing after time off due to illness. Your tips are a great way forward. Thanks! Great motivation to get ready to simplify. Routines and to-do lists are my JAM! 🙂 Seriously, they keep me going every day! These are awesome tips, Terryn! Great post, Terryn! Each one of these are important when it comes to living as simple as possible! I actually use them all! I definitely need to learn to delegate. I think I can do all then I become easily frustrated. I need to learn to say no to myself! I tend to plan out so many tasks to that I can’t possibly get them all done in a day. It is hard for my to give something up that I would like to do. Thanks for the post! Learning to say no is my downfall :/ Working on it!! Great tips and something I need to work on. I always feel like I can never catch up, mostly because I take too much on at once! Nice! Under routines I might add “Batch!” – combine together like things (social media, emails, meetings) into chunks of time so that they don’t overwhelm the whole day. These are all great tips! I am also a big list maker. I have found that making my to-do list the night before has really helped keep me on track. I know exactly what my main priorities will be for the next day. I’m feeling the urge to simplify and improve my productivity this month, too! You know what I just did? I unsubscribed from all marketing emails and unfollowed hundreds of pages on Facebook and Instagram to make sure I only see the things that inspire me. I feel SO much better!! Oooh, that is so good Robin! I need to do that with my pages too. It’s a daunting task, but I bet it feels amazing! I love setting up routines, I feel so much better when I’m following a routine and always feel completely thrown off when I’m not doing so. Good advice, beautiful blog! I look forward to reading more. Great ideas. It can be difficult to stay focused on productivity, but setting up routines help a lot!